On Monday Emily and I were treated to a celebrity luncheon as we watched the 89th Academy Awards while sipping Moet & Chandon French Champagne. 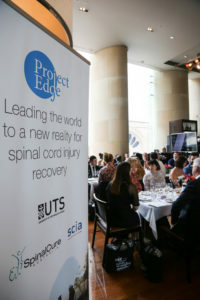 Channel 9 presenters Georgie Gardner and David Campbell introduced the event as a fundraiser for SpinalCure – Project Edge. Logie Award winner Miranda Tapsell from the T.V. series Love Child who also helped pull winning tickets in the raffle. Ben Mingay who starred in the 2016 Hacksaw Ridge (Grease Nolan) winner on Monday for Best Film Editing and Best Sound Mixing. Hacksaw Ridge was nominated for Best Picture and Best Director. Sam Neill the famous New Zealand actor was present! 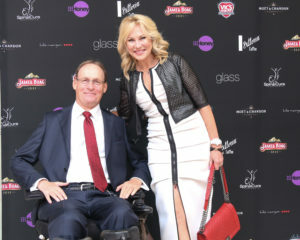 Duncan Wallace CEO, SpinalCure Australia with Professor Bryce Vissel, who heads Project Edge at the Centre for Neuroscience and Regenerative Medicine at UTS, pictured here with Emily – who is hoping that Project Edge might one day help her recover from her spinal cord injury caused by a snowboarding accident. After an entrée of salmon ceviche we were served a perfect beef fillet followed by a delicious sheep’s milk cheesecake, strawberries and meringue. As Vittoria was a sponsor we enjoyed a cup of their coffee as we sat back and watched the Academy Awards revealed correctly and incorrectly! 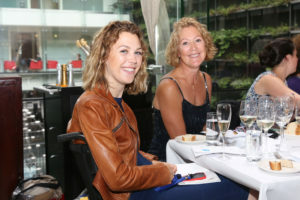 No slips at the Glass Brasserie as the raffle was pulled by glamorous celebrities. 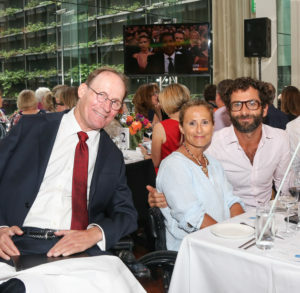 Thank you to the key sponsors, all of whom made the event possible: 9Honey, Vic’s Premium Quality Meat, James Boag’s Premium Lager, Moet & Chandon Champagne, The Luke Mangan Group, Little Creatures Pale Ale, Joto – The fresh fish people, Hilton – Sydney, Vittoria Coffee, L.J. Parthenos & Son. 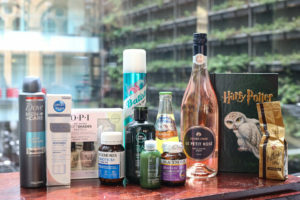 Gift bags were a delight for us to unpack at home courtesy of: Virgin, Nine Live, Warner Bros, Manrags, OPI, Star and PR Events, Xtend Barre, Paul Mitchell, Sweaty Betty PR, Secret Bottle, Maritime Museum, Hedgren luggage, Blackmores and San Pellegrino. Many thanks. Monday was an exciting start to the week, fun to watch the Oscar envelopes opened and winners announced from Hollywood, Los Angeles. Emily and I have seen many of the nominated movies and delighted in the ceremony but our day was made by the cast of personalities attending the luncheon around us. Their generosity of time towards a cause deeply personal to us was touching and gracious. 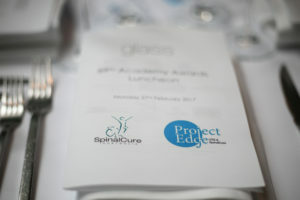 Thank you to everyone who attended, bought a raffle ticket and made the occasion a winner for SpinalCure – Project Edge. Sydney Morning Herald’s Andrew Hornery having a private moment with me! 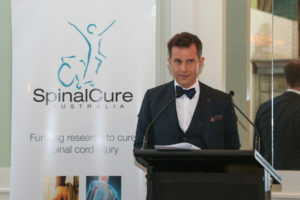 Take a look as the most exciting collaboration between University of Technology Sydney (UTS), Prof Reggie Edgerton of UCLA, SpinalCure Australia and Spinal Cord Injuries Australia (SCIA). Using currents of electricity to ‘re-ignite’ injured spinal cords. 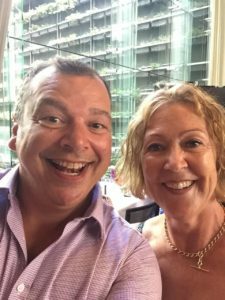 www.projectedge.org.au – You can donate now! The neurostimulation project aims to develop technologies and treatments which can become an integral part of rehabilitation programs nationwide, resulting in improved clinical, financial and personal outcomes for people with spinal cord injury (SCI). These treatments will also help to address the severe economic toll of SCI in Australia – estimated to be $2 billion * annually in direct health and lost productivity costs. Pictured below is Duncan Wallace with Sam and Cameron Bloom. Cameron’s photographs in Penguin Bloom inspired Reese Witherspoon and Naomi Watts to produce a film adaptation of the book called Penguin the Magpie. I hope next year at the 90th Academy Awards we are here with Penguin the Magpie as a film nominee! Penguin Bloom tells the story of how a baby magpie helped a northern beaches family cope with a devastating accident. Supporting SpinalCure with 10% of book proceeds. Buy the book now – all proceeds to SpinalCure. 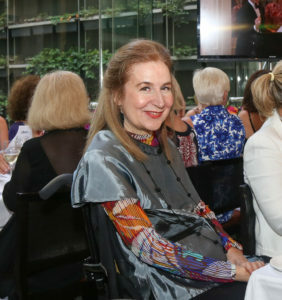 Finally a big thank you to Joanna Knott, MBA BA (Hons) MPRIA OAM – Chair of SpinalCure Australia – Thank you for our invitation but also for your dedicated commitment to SpinalCure, I am so proud to call you a friend. *Access Economics, June 2009 – John Walsh (independent Actuary) has confirmed this figure. 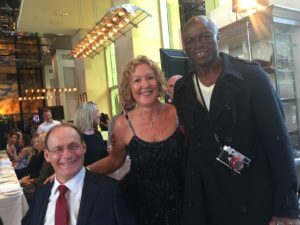 This entry was posted in Life after SCI, Medical Issues and tagged 89th Academy Awards, Channel 9, Duncan Wallace, Fundraising, Joanna Knott, neurostimulation project, Oscar lunch, Penguin Bloom, Project Edge, SpinalCure, Suddenly an Everyday Carer by everydaycarer. Bookmark the permalink.